We decided that you Hooligans were so good this year, that Santa’s coming a little early! This limited edition Santa-rific Hoo will turn even the grouchiest of grinches into a jolly joy this Holiday season! Nothing like a FREE Hoo-Rag! Thanks. Kind of creepy, but I get a lot of compliments. I love this product. Its very festive, comfortable, breathable. Its perfect for cool weather and for fishing as well. It fits perfect and looks pretty awesome. The family loves it too. Looks great, and it goes nicely with my Santa cap! Ready for a Christmas cycle run with the gang! This is a very nice lush red color. Hoorags are great for skiing/snowboarding. I actually had my ski mask fog up, it wasn’t until I received my hoorag this problem stopped occurring. So thin you can breathe easily through them, but knitted tight enough to keep air from getting in and making your face cold. If however this does get wet, like most masks like to do when you are shredding down the mountain, it’s a breeze cleaning/drying! Quality is outstanding, this is 1 of 4 we own. Very lightweight and breathable. I thought this would be a little bit thicker (for cold weather since it’s a holiday theme), but all in all, nice. As always wonderful product! Functional, great graphics, you can’t go wrong with any Hoo Rag! It was a Hoo Rag freebie, my sister loved it but reminded me not to wear it into businesses and especially into the bank when wishing friends and associates a Merry Christmas as I’d probably spend mine in Jail. Hahaha, it’s a fun Hoo! Love all my Hoo-Rags, but this one was great to hand out presents on Christmas morning. Great idea by hoorag for the holidays! Quality ,comfort and awesome graphics. Great! I gave it to my grandson who just loves it! Love both my Hoorags and the people at the company are so nice and very fast shipping. Would recommend them and their products to anyone. Shipped fast. I have 7 hoo’s already !!! I love this one , especially with a Santa hat . Truly an awesome invention for those of us who enjoy the outdoors as I do. The material is lightweight, but still manages to keep you nice and warm against the elements. 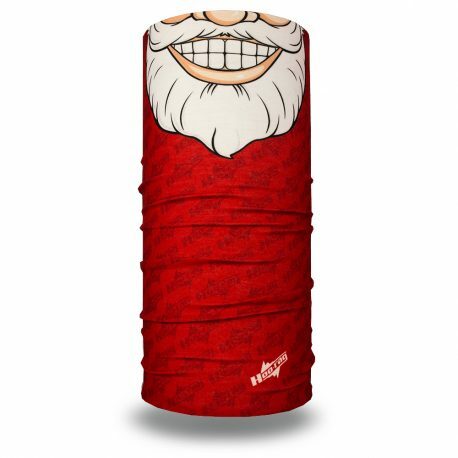 Having a Santa face on it truly makes it a fun piece to wear when you are out and about. One of my favorite parts of these is that I can wear it as a face mask and I don’t fog up my prescription glasses at all. 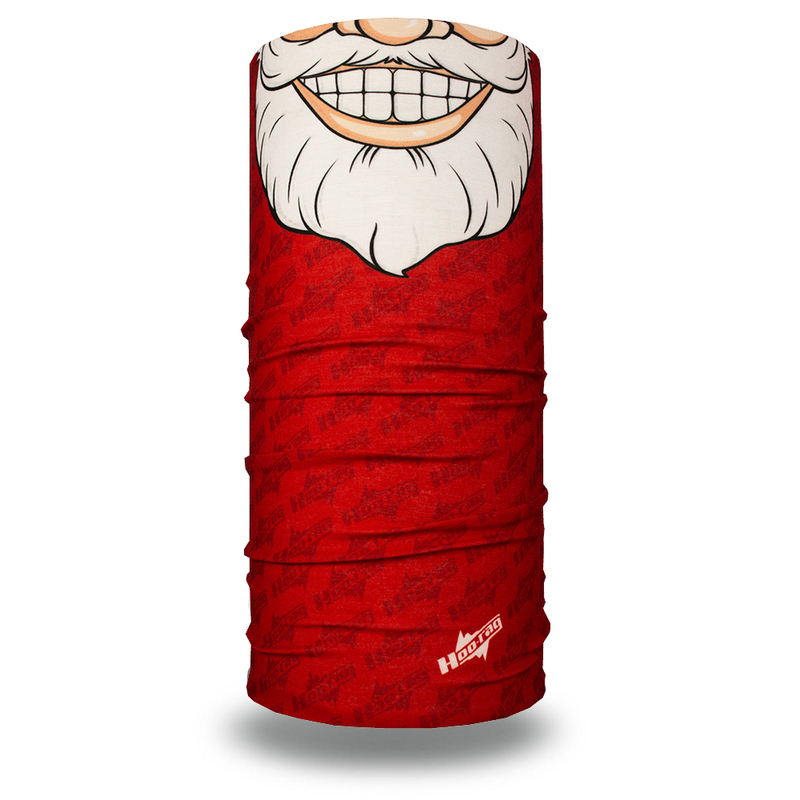 Love my HoHoHo Hoo-rag, it’s my now comp one for the holidays! I love it! I’m wearing everyday til Christmas. One can never have too many Hoos! My favorite is still the Zombie, but I needed this one for a Christmas run. I also use them when riding my motorcycle and as beanies. Love them all! I got my first hoo-rag as an award for a (zombie-related) story I wrote, and didn’t wear it for about 2 years. Then I got it out. I put it on, and…. I live in a cold place, with a dog. A dog who has to get up and walk on the leash at 1 AM in the morning, in single digit and below weather. My face used to freeze and burn from the wind. Now it stays toasty warm. I throw it on over my head with the back end pulled up under my hat, so nothing but my eyes are showing, and then when I come inside, or say walk inside a bank or other facility, I just tug it down around my neck. Where it’s like a pleasant manly version of a neck warmer. It’s also handy for keeping sun off, keeping face warm, and looking intimidating. This one was a part of my Christmas order, this year I’ve bought one personalized for each member of my family. Stay warm. Exactly as described. Perfect fit, fast shipping.